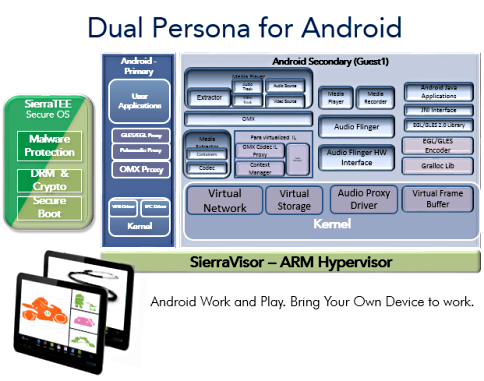 SierraVisor Dual Persona SDK is the first true end-to-end solution that includes all the features needed for a complete Android stack. The SierraVisor Dual Persona Kit also allows smartphones and tablets to run heterogeneous operating environments like QT and DirectFB with Android. Providing a seamless user experience, SierraVisor Dual Persona enables mobile phone owners to enjoy the whole breadth of applications available in the Google Play digital media store and third party application stores. Today's user experience requires the ability to play high definition video and GPU intensive games and to support external devices. The growth of Bring Your Own Device (BYOD) and the ability to have custom Android solutions requires standardized interfaces for Digital Rights Management (DRM) and malware protection. DRM solutions like Google Widevine® require the full audio and video data paths to be processed outside Android memory. The hypervisor and TEE must interface with each other to ensure the compressed, encrypted video can be transferred to the TEE in a safe and secure manner. Also providing a timely manner to process the data is critical for a seamless streaming user experience. As more and more content is streamed via applications like Miracast and HDCP, content path protection is an absolute must have. Given the power limitations of most of mobile platforms, having a large amount of memory may not always be possible. Android requires multi-gigabytes of memory to provide responsive user experience. SierraVisor is designed and implemented with this goal in mind. It requires the least amount of resources, reserving more than 99% of the memory for Android. Also its flexible memory re-partitioning scheme allows for memory to be migrated from one guest to another on-demand. The Android user interface and features require a multi-core CPU and GPU. Sierraware�s SierraVisor hypervisor under several benchmarks has proven to be one of the most efficient implementations. It provides near native CPU and GPU performances for memory bandwidth, CPU ALU processing, GPU Compute, fill rate, and more. With the ability to run un-modified OpenGLES native apps on Android, it provides the true GPU/CPU virtualization encompossing both compatibility and performance requirements. GPU: Native OpenGLES API. Support various multi-core GPUs from PowerVR, Mali, Vivante and NVIDIA. Codec: Paravirtualized OMX IL. Full 1080@60 Video. Ability to natively decode video directly via hardware. Audio: Support for both game audio and streaming audio. Native PCM and other hardware supported Codecs.